Injections comprise another nonsurgical treatment option for pain. They are typically considered as an option to treat joint pain after a course of medications and/or physical therapy is completed, but before surgery is considered. Injections can be useful both for providing pain relief and as a diagnostic tool to help identify the source of the patient's pain. How Injections Relieve Back Pain? 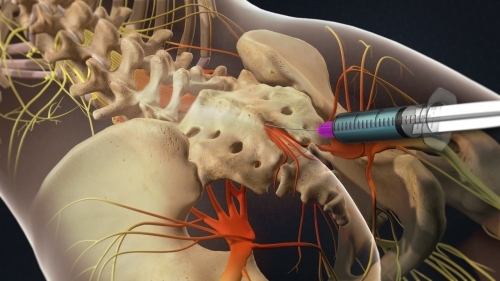 Trigger point injection (TPI) may be an option for treating pain in some patients. TPI is a procedure used to treat painful areas of muscle that contain trigger points, or knots of muscle that form when muscles do not relax. Many times, such knots can be felt under the skin. Trigger points may irritate the nerves around them and cause referred pain, or pain that is felt in another part of the body. 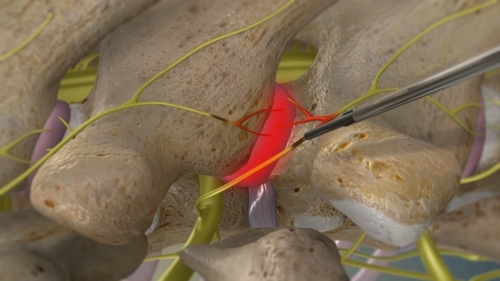 For the TPI procedure, a health care professional inserts a small needle into the patient's trigger point. The injection contains a local anesthetic or saline, and may include a corticosteroid. With the injection, the trigger point is made inactive and the pain is alleviated. Usually, a brief course of treatment will result in sustained relief. Injections are given in a doctor's office and usually take just a few minutes. Several sites may be injected in one visit. If a patient has an allergy to a certain drug, a dry-needle technique (involving no medications) can be used. Depending on the product used, you will receive one to five shots over several weeks. During the procedure, if there is any swelling in your knee, your doctor will remove (aspirate) the excess fluids before injecting the hyaluronic acid. Usually, the aspiration and the injection are done using only one needle injected into the joint, Some doctors may prefer to use two separate syringes. For the first 48 hours after the shot, you should avoid excessive weight bearing on the leg, such as standing for long periods, jogging or heavy lifting. Side Effects:You may notice a local reaction, such as pain, warmth, and slight swelling immediately after the shot. These symptoms generally do not last long. You may want to apply an ice pack to help ease them. Complications:Rarely, patients may develop a local allergy-like reaction in the knee. In these cases, the knee may become full of fluid, red, warm, and painful. If this occurs, contact your doctor immediately. This injection procedure is used to diagnose back pain or neck pain from the nerves through the facet joints of the spine. Medial branch nerves are small nerves that feed out from the facet joints in the spine and carry pain signals from the facet joints to the brain. 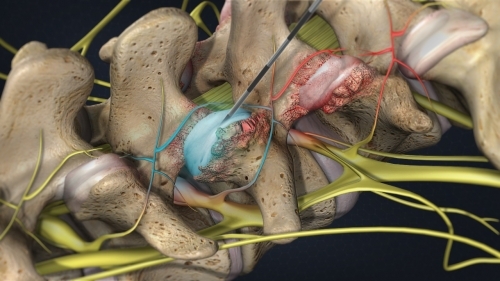 A medial branch nerve block is a procedure in which an anesthetic is injected near small medial nerves connected to a specific facet joint. Typically several levels of the spine are injected in one procedure. If the patient experiences marked pain relief immediately after the injection, then the facet joint is determined to be the source of the patient's pain. Radiofrequency ablation is a minimally invasive procedure that is usually performed with local anesthetic and mild sedation. As with many spinal injections, radiofrequency neurotomy is best performed under fluoroscopy (live x-ray) for guidance in properly targeting and placing the needle (and for avoiding nerve or other injury). An epidural injection is effective in significantly reducing back pain and/or sciatica from spinal stenosis and other conditions. Epidural steroid injections (ESIs) are a common treatment option for many forms of low back pain and leg pain. They have been used for low back problems since 1952 and are still an integral part of the non-surgical management of sciatica and low back pain. 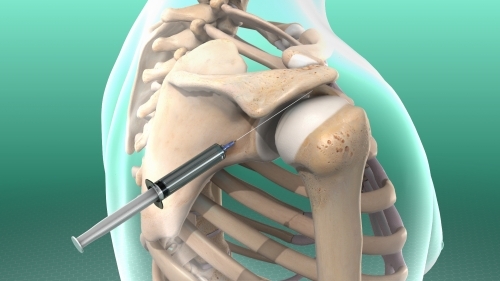 The goal of the injection is pain relief; at times the injection alone is sufficient to provide relief, but commonly an epidural steroid injection is used in combination with a comprehensive rehabilitation program to provide additional benefit. Most practitioners will agree that, while the effects of the injection tend to be temporary - providing relief from pain for one week up to one year - an epidural can be very beneficial for a patient during an acute episode of back and/or leg pain. Importantly, an injection can provide sufficient pain relief to allow a patient to progress with a rehabilitative stretching and exercise program. If the initial injection is effective for a patient, he or she may have up to three in a one-year period. Sacroiliac joint injection is used either to diagnose or treat low back and/or leg pain associated with sacroiliac joint dysfunction. A sacroiliac (SI) joint injection-also called a sacroiliac joint block-is primarily used either to diagnose or treat low back pain and/or sciatica symptoms associated with sacroiliac joint dysfunction. A diagnostic SI joint injection is used to confirm a suspected diagnosis of sacroiliac joint dysfunction. This is done by numbing the sacroiliac joint with local anesthetic (e.g. lidocaine). 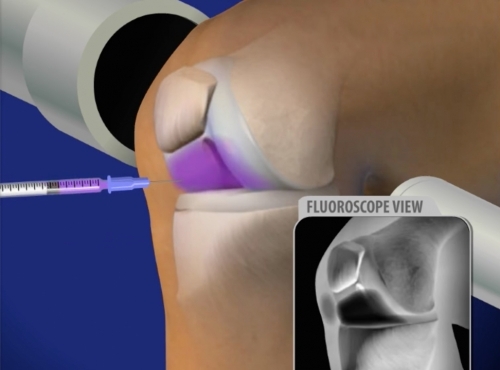 The injection is performed under fluoroscopy (X-ray guidance) for accuracy. Once the needle has entered the sacroiliac joint, contrast is injected into the joint to ensure proper needle placement and proper spread of medication. The numbing medication is then injected into the joint. After the numbing medication is injected, the patient is asked to try and reproduce the pain by performing normally painful activities. If the patient experiences 75-80% pain relief for the normal duration of the anesthetic, a tentative diagnosis of SI joint dysfunction is made.